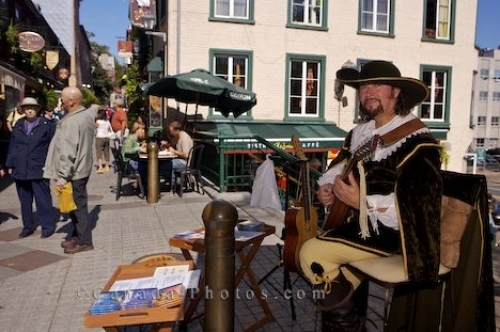 A musician sets up an area along the Rue du Petite Champlain in Old Quebec City, Canada where he plays his mandolin for the people passing by. The musician dresses in costume while he sits here on a regular basis during the summer when tourists fill the Rue du Petite Champlain. Many people stop to listen to the beautiful sound of the mandolin while they rest and take in the sunshine. Picture of a musician playing his mandolin in the sunshine which brightens up the Rue du Petite Champlain in Quebec, Canada.